Cruises score big points with families, offering up value, adventure and convenience (see the world and unpack once!). You also get a something-for-everyone atmosphere where diverse diversions appeal to babies, teens and kids in between — not to mention good ol’ mom and dad. So how to make the most of an at-sea getaway with the gang? The stress-free key is to properly prepare and plan before you travel. 1. Choose a cruise line that caters to kids. Your long-awaited family escape isn’t the time to try and reinvent the (ship) wheel. Several major cruise lines have made a business out of not just tolerating but positively catering to families with kids in tow. Choose one of them, and you’ll be tasked with far less creative thinking when it comes to conjuring up wee-one-friendly activities, dining, accommodations and excursions. Carnival Cruise Line, Disney Cruise Line, Norwegian Cruise Line and Royal Caribbean International are some of the industry’s very best bets for big ships brimming with enough bells and whistles to wow kids of all ages without busting your budget. But don’t overlook more under-the-radar options either. You might consider the active, adventure-driven expedition voyages from Lindblad Expeditions (presented in partnership with National Geographic), or Disney-themed European river cruises aboard AmaWaterways. 2. Take advantage of kids’ clubs. Ensure the ship you pick has a standout kids’ club and then embrace the chance for some time away from the brood. These complimentary kids’ clubs — set in dedicated drop-off youth facilities — come staffed by pro counselors and are broken down into age-appropriate groupings, with tailored programming to suit preschoolers through teens (typically accommodating ages 3 to 17). Best of all, while the young’uns are happily occupied with fun activities (think scavenger hunts, karaoke, arts and crafts and pool games) and new at-sea friends, mom and dad can indulge in some coveted grown-up time, whether it’s the spa, casino or a dinner-for-two that you crave. Try Carnival, Disney, Norwegian, Princess Cruises or Royal Caribbean for some of the best kids’ clubs in the biz. Tip: Many lines additionally offer evening group or, more rarely, private in-cabin babysitting services (for a fee), so be sure to inquire ahead. 3. Consider the limitations for babies and toddlers. While family-friendly cruise lines roll out the Romper Room-ready red carpet for kids 3 and older, lines that cater to babies and toddlers 2 and younger are significantly more limited in scope. In fact, the minimum age to even set sail is 6 months (and sometimes, a year) on most voyages, so you might not be able to bring your baby on board period. Plus, most companies won’t allow kids who aren’t fully potty-trained to access pools and water park areas, nor do they generally run designated kids’ clubs programming for tots younger than 3. 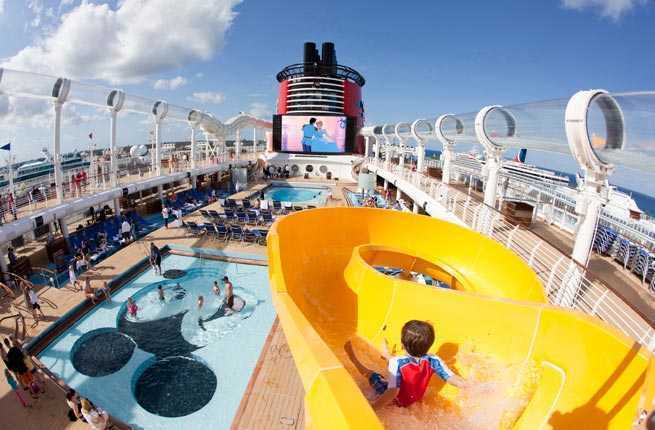 Among the rarer cruise lines that offer nurseries or play areas geared especially toward babies and toddlers: Cunard Line, Disney, Norwegian and Royal Caribbean. 4. Book a shorter itinerary to test the waters. That dream two-week-long Panama Canal crossing or expedition voyage to Antarctica is probably not the best match if you’re looking to see how things go with the children. Play it safe and test the waters on your first family sailing by booking a voyage that’s shorter in duration. Lines such as Carnival, Disney, Norwegian, and Royal Caribbean all offer short-and-sweet three- to five-night cruises to fun-in-the-sun destinations such as the Bahamas, Caribbean, Bermuda and Mexico — perfect if your kid ends up overstimulated or if seasickness strikes and you want to jump ship sooner than later. Best of all, these quickie sailings leave from easy-access, close-to-home ports, too, such as New York, Miami and Los Angeles, which can potentially save a bundle on having to fork out for expensive family airfare. 5. Select your cabin carefully. If you don’t have the budget for a splurge on a suite — or for two connecting or adjoining cabins, for that matter — standard cruise ship staterooms that are already known for their tight quarters only get snugger with more tiny bodies to pack in. (Third and fourth guests are typically accommodated via pulldown bunks or pullout sofas — or with loaner cribs or play yards). When booking, think about the reality of having just one shared room when it comes to downtime, especially if you have kids that take naps or have early bedtimes. Try to book a family-geared stateroom equipped with dividing curtains, a separate seating area, and/or a balcony, all of which can be lifesavers, ensuring that you don’t have to sit in suspended animation while the kids snooze. Also keep in mind that the vast majority of cabins come with shower stalls, not bathtubs, so you’ll have to be creative when it comes to smaller kids’ bath times (a take-along inflatable tub has been known to do the trick). 6. Pick a ship with pools and water parks. A hard-and-fast rule behind the science of parenting: Everybody loves hanging out by the pool. So if you’re sailing through sunny climes, a surefire crowd-pleaser for kids and ‘rents alike is simply pulling up some deck chairs and spending a morning or afternoon splashing around the pool or in a water play area. As a rule of thumb, the bigger and newer the ship, the more opportunity for water-themed fun, with many modern megaships boasting multiple pools, winding waterslides (note they have height restrictions) and colorful splash zones. Just keep in mind that for hygienic purposes, most cruise lines prohibit diapered tots in the pools, so plan accordingly. Another word to the water-bound wise: The pool is a top spot to hit on embarkation day, so be sure to pack your swimsuits and sunscreen in your carry-on bags, since you’ll be boarded hours before your checked luggage makes it to your stateroom. 7. Don’t overschedule your trip. Accept that your vacation style before kids is a thing of the past. Keep disappointment at bay by embracing flexibility and resist overscheduling your cruise vacation with a million plans that a tired-out kid (or, mom, for that matter!) might ultimately keep you from. Keep the itinerary loose, and factor in lots of downtime. If your kids are flexible and old enough to deviate away from their normal schedules, try to forgo the regular at-home routine in favor of napping when you’re tired, eating when you’re hungry, getting off the ship when you’re ready to and maybe even having a little leeway with their bedtimes, too. Should you sign up for group shore excursions — you’ll be traveling to some interesting new places, after all — try to set out on those that are family oriented; simply selecting shorter ones, for instance, can help avert meltdowns. Don’t be afraid to venture out on your own, either, so that you can really keep to your own schedule — booking a private tour or just hopping in a cab to the nearest stretch of sand can ensure you dictate the day’s flow on your own terms. And if you do stay on the ship while it’s in port, don’t dismay: It’s a great opportunity to enjoy the facilities with elbow room to spare while everyone else is off exploring. Originally written by Elissa Garay.